In 1986 we note the appearance of the character Athena in the platform game namesake, and the following year in Psycho Soldier. It is fun to see that the company will resurrect this character years later in The King of Fighters saga. It will also be the case for Ralf, Heidern Clark who came from Ikari Warriors games. 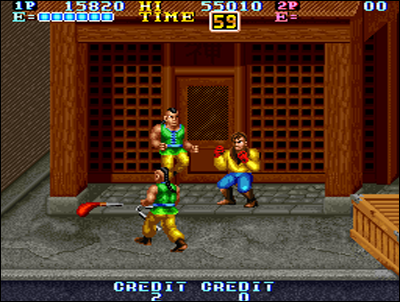 SNK rides on the success of its latest creations for some time, by porting its huge arcade successes on the most popular home systems. The publisher only release a few mediocre titles the next year, probably more focused on marketing than on creativity. But this was forgetting that Alpha Denshi - SNK's twin developing company - was working! The guys program the fabulous Time Soldier under the Romstar label in 1987. 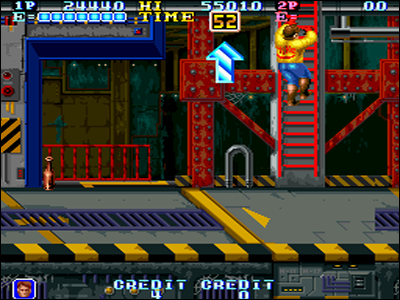 Vertical action shooter, the game immediately reminds Ninja Commando. The resemblance is striking! The game is fast, straight-forward, but so good! 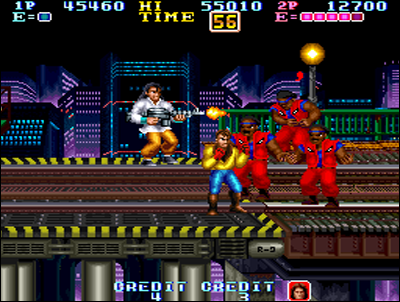 The scrolling is done alone, like in a Shoot them Up; the gameplay is looking like Commando, with the difference that in this one, you are heavily armed! Multiple shots, lasers, super attacks... Offering an unteresting cooperative play, Time Soldiers became an arcade classic, which will be adapted - among others - on Master System. Try this now, for those who yet don't know this great game! SNK has always realized nice golf games, featuring a great gameplay, the most realistic and accurate as possible. And it is not the first of these, namely Lee Trevino's Fighting Golf, that will make me lie. Actually packing superb graphics back in its era, the game has perfect controls and proposed all the options! Supervised by a legendary golf player of the eighties, this SNK game was considered as the best of its kind. Offering to choose among four golfers and two different courses, the game was rich and pleasant, golf amateurs will not be deceived! 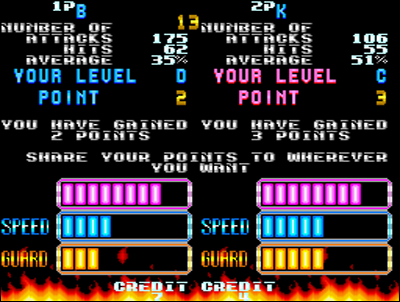 Real arcade success, the soft was ported for the NES in 1988, and made very good sales. No doubt we are in the presence of Top Player's Golf's ancestor . Uhm... do these screens ring a bell? The same year, SNK Gold Medallist is released, and it is SNK's own interpretation of the famous Track'n'Field from Konami. And the game is just as great as that of the rival firm, but... it's way much harder! The reputation of SNK games for being incredibly difficult didn't happened yesterday... 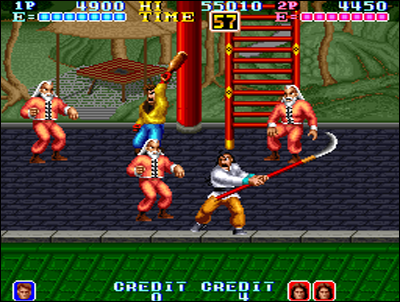 In addition, Gold Medallist was not very well distributed outside Japan, and the game were far less successful than the one on which it is based. SNK uses the success of Rambo to sell games about war! 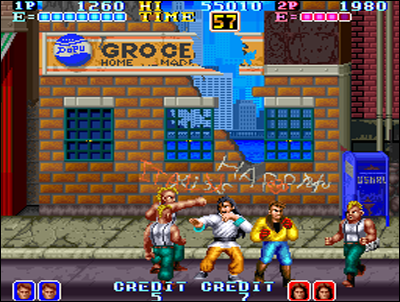 First Beat them Up the firm, POW was an excellent fighting game, which could have had a sequel, but we didn't heard about anymore... no ports, no second round... and this is a shame, because we haven't seen much titles technically as good as this one on Neo Geo. You play as a prisoner of war (surprise) and your mission is to escape from the camp where you are retained. Punching, kicking, butting, jumps ... handguns, firearms ... the range of attacks is vast! Prisoners of War looks like a mixture of Renegade and Double Dragon. 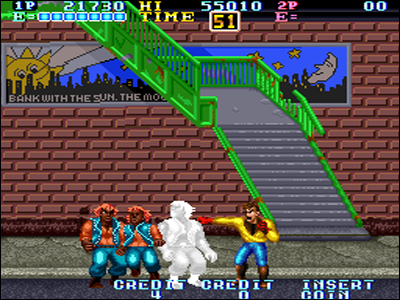 Beautiful, smooth, with a well-crafted gameplay, the game met some success in the arcades. Until the following year, when the Beat them Up makes a quantum leap with Capcom and its spectacular Final Fight. Gang Wars was a quite taking beat them up back then!